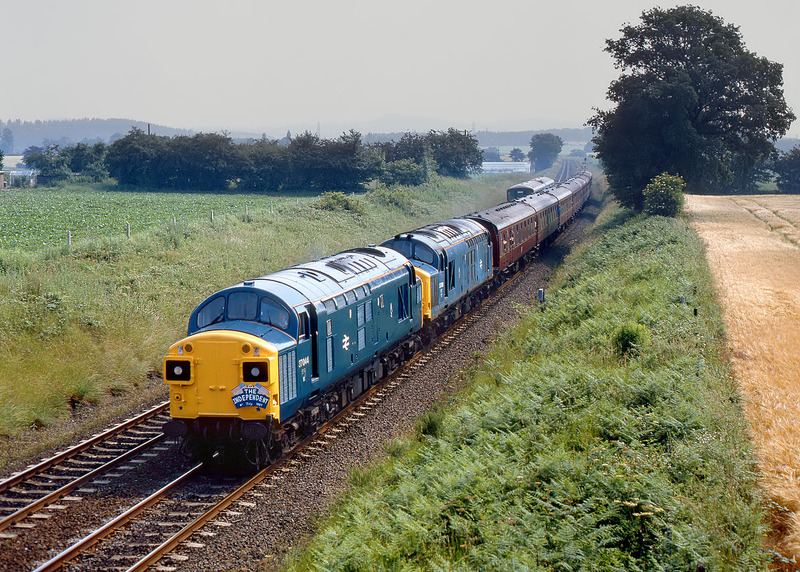 37044 & 37091 pass Hodgehill Farm, on the eastern edge of Kidderminster, with the Hertfordshire Railtours 1Z37 07:30 Finsbury Park to Bridgnorth 'Independent' (US Independence Day - 4 July) railtour on a slightly hazy 4 July 1987. Nice to see that at least 37044 appears to have specially cleaned for the occasion. The 37s would hand over to Western haulage on the Severn Valley Railway. D1062 Western Courier outward and D1013 Western Ranger return, The tour later visited the Great Central Railway, where haulage was courtesy of 40106 Atlantic Conveyor & LNER B1 Class 4-6-0 1306 Mayflower.